For those of you who don't know - I am a proud member of the Color Me Scrappy DT. Color Me Scrappy is a challenge blog that offers new challenges on the 1st and 15th of every month. The first challenge has gone live TODAY! The design team hopes to inspire all of you. 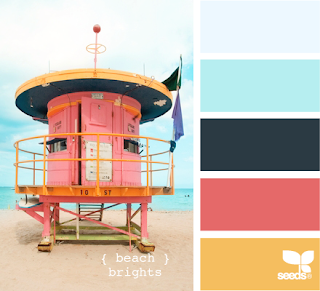 We can't wait to see what you come up with so be sure to visit the Color Me Scrappy blog and play along with us. Did I mention there are prizes to be won? This is the first color pallet for the challenge. Lovely colors, yes? ...And this is the layout I came up with using the color pallet. The colors were a ton of fun to work with and really made me think outside of my usual color pallet box. I love the mix of the navy blue tone on the yellow/orange tone. The photos are of my daughter swinging on the 'big girl' swing for the first time. 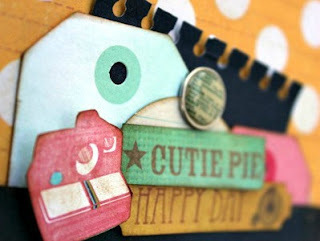 So gather your supplies, head on over to the Color Me Scrappy blog, and play along! OMGosh, what a great page! 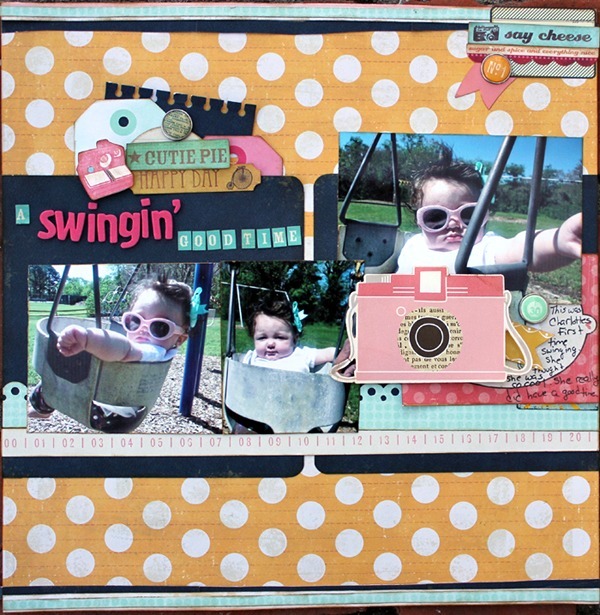 Love all the little details in this layout :) and what a cutie...love the sun glasses! LOL!! Thanks for the inspiration! Love it! The tags and stuff peeking out near the top are so cute, as are your photos! o0oo0o0o!! I REALLY love your layout!! It's beautiful! Gorgeous colors and a beautiful layout! Fabulous layout! The clusters of embellishments are wonderful! SO fun! I love the yellow and pink together! Wow! What a great take on the color challenge! The photos were "made" for this LO! Those photos are too cute. Cool take on the colors challenge! Your layout is lovely, such sweet photos. Yay, great to see your first DT layout! How exciting! Great colourway! Love that it is fresh and springy but has that great dark blue thrown in. Wow love the colors and the layout!